In September 2002 in Milwaukee, Wisconsin, a 36-year-old man was beaten to death by a mob of children. Eleven children between the ages of 10 and 17 subsequently were charged. Ten of those children had a parent who was in jail or formerly incarcerated. Big Brothers Big Sisters of Metro Milwaukee hopes their Amachi program will help reduce the chances that this type of tragedy will happen again. BBBS of Metro Milwaukee relies on prison visits to locate children of incarcerated parents. Over the past year, McCanse has developed a close relationship with the warden of Taycheedah Prison. She has visited the institution a few times to speak with inmates about the Amachi program and regularly visits other prisons in the state as well. McCanse attributes the program’s achievements thus far to the intensive summer months spent pre-planning in 2003 and the important partnerships developed with churches and the community. However, forging these relationships was not an easy task. Prior to Amachi, “we had no partnerships with faith-based organizations, specifically black churches in the inner city, many of which are very powerful in the community,” said McCanse. Wisconsin ranks highest in incarceration rates of African Americans—more than any other state, according to McCanse, and the majority of the children of Wisconsin’s incarcerated parents live in the Milwaukee area. Thus McCanse set out to hire staff who could approach churches in the predominantly African American communities where many children live. Currently, 8 of the 12 Amachi staff members are African American and are parishioners and leaders from the community—they serve as project director, recruitment coordinator, and enrollment and match specialists. With these leaders on board, the agency was able to contact between 75 and 100 churches. However, McCanse soon realized that they should concentrate on their target areas and not spread too thin. BBBS of Metro Milwaukee originally asked for 10 volunteers from each church, but many of the churches seemed overwhelmed. The agency now asks for 10 volunteers, but requires only five. Another challenge the agency encountered was the joyful onslaught of volunteers on Sunday morning after the pastor encouraged the congregation—a number of times when the agency followed up with the eager church members the next day, they were no longer interested. By maintaining a positive relationship with the church pastors, the agency was able to return to each pastor and discuss the situation. BBBS of Metro Milwaukee learned that finding committed volunteers is only the beginning and that sometimes it takes creative planning to maintain a volunteer base. The agency recognized that 25 to 30 percent of their Amachi volunteers did not have valid drivers licenses and/or car insurance but were still valuable potential mentors who they did not want to turn away. Therefore the agency set up four sites (schools, an after-school center and the YMCA) in the targeted communities, allowing mentors and mentees to meet at a convenient location and then walk or take public transportation to various activities. The innovative approach proved quite successful. 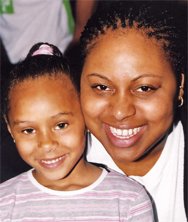 As of July 31, 2004, BBBS of Metro Milwaukee had generated 203 matches (the program started on October 1, 2003).